G Prabhu, J Miller, D Stuart, G Prabhu, T Zafar, Q Zafar. Enterocutaneous Fistula — Rare Presentation of Appendicitis. The Internet Journal of Surgery. 2018 Volume 35 Number 1. A 45-year-old Caucasian female present to the emergency room with severe right lower quadrant pain and abdominal distention. The patient reported that over the last seven days she had experienced pain but in the last four days it has become increasingly severe. The patient endorsed chronic constipation secondary to opioid use and stated that she had a fever. Upon presentation the patient didn’t have abnormal vital signs. On physical exam the patient had abdominal tenderness to palpation, specifically in the right lower quadrant. CT scan with IV contrast was performed which showed abscess formation in the mid-anterior abdominal wall with intraperitoneal extension and another 4cm intraperitoneal collection in the right lower quadrant. The patient was taken to the operating room and was subsequently found to have an appendicitis with an enterocutaneous fistula. This case report will discuss an atypical presentation of appendicitis with enterocutaneous fistula. Appendicitis is one of the most common medical problem that requires immediate surgical intervention in the United States. Most of the patients with appendicitis present with pain in the right lower quadrant of the abdomen. Enterocutaneous fistula is a surgical complication of appendectomy  and very few cases have been reported with a fistula as the presenting symptom of appendicitis prior to surgical intervention. This case will discuss a rare presentation of appendicitis that describes a patient who presented with abdominal wall abscess that was later diagnosed as enterocutaneous fistula. A 45-year-old female presented to the emergency department complaining of constipation and abdominal distention for 7 days. The patient has a history of chronic constipation due to long term opioid use. She reported increasingly severe abdominal distention for 4 days, which has been causing pain in the right lower quadrant with radiation to her back. The patient endorsed fever and chills but had no fever at presentation. The only abnormal lab was a leukocyte count of 13.8 x 103. During physical examination palpation of the lower abdominal wall elicited significant pain. A CT scan with contrast was subsequently ordered and revealed a 9.5 x 8 cm abscess formation in the mid anterior abdominal wall with intraperitoneal extension and another 4cm intraperitoneal collection in the right lower quadrant (Figure 1). The decision was made to drain the abscess. The patient was taken to the operating room for diagnostic laparoscopy with possible open wound drainage. Upon placing the camera through the 5mm port a cystic mass was seen in the right lower quadrant with multiple adhesions. The procedure was converted to an open wound drainage. A midline incision at the lower abdomen drained allowed drainage of purulent material with subcutaneous tissue and muscle. Necrotic muscle was visualized and the wound was debrided with dimensions of 20cm x 15cm. As the abdominal cavity was entered, the appendix was noted to be adherent to the abdominal wall and was perforated. A cystic mass was noted near the cecum and both the appendix and cystic mass were excised for pathology. The abdominal cavity was irrigated and closed using interrupted Vicryl stiches. The wound was left open due to extent of the necrosis and further debridement is anticipated (Figure 2). The first specimen sent to pathology showed acute appendicitis and the second specimen obtained over the cecum showed benign multi-loculated serous cystadenoma. 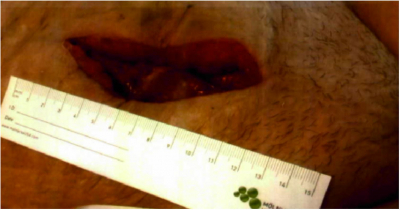 Upon further debridement the wound margin was cleared and the remaining abscess was drained. Appendicitis is a common but life-threatening condition. Appendicitis occurs in 7% of the US population, with an incidence of 1.1 cases per 1000 people per year . It is very important to identify and diagnose patient presenting with atypical symptoms of appendicitis including those with rare presentation as in this case. Enterocutaneous fistula are usually seen in conditions such as diverticulitis and Chron’s disease but has been rarely seen with appendicitis. The mechanism related to this is believed to be inflammation and rupture of the appendix near the adjacent skin. This leads to formation of sinus tracts that cause inflammation of the adjacent structures such as the anterior abdominal wall muscles, as seen in this case. Radiologic tests such as CT scan of the abdomen are very essential and are an important tool in diagnosis. In cases of appendicitis with an atypical presentation Multi-Detector Computed Tomography (MDCT) has shown to be very useful in making the correct diagnosis . It is also important to acknowledge the atypical presentation of appendicitis, previous case reports have shown various presentations of appendicitis including pain in epigastric region with normal vital signs . As a clinician any suspicion of appendicitis with atypical presentation should be evaluated with radiological tests to reach to a definitive diagnosis. 1. Agostinho, Nelson, et al. Advances in Pediatrics., U.S. National Library of Medicine, 2017, www.ncbi.nlm.nih.gov/pmc/articles/PMC5394400/. 2. “Appendicitis: Practice Essentials, Background, Anatomy.” Background, Pathophysiology, Etiology, 23 Apr. 2018, emedicine.medscape.com/article/773895-overview#a6. 3. Kim, H C, et al. “Added Diagnostic Value of Multiplanar Reformation of Multidetector CT Data in Patients with Suspected Appendicitis.” Advances in Pediatrics., U.S. National Library of Medicine, www.ncbi.nlm.nih.gov/pubmed/18349447. 4. Odabasi, Mehmet, et al. Advances in Pediatrics., U.S. National Library of Medicine, 2014, www.ncbi.nlm.nih.gov/pmc/articles/PMC3921649/.